Art and music go hand-in-hand. Both tend to be a flowing and often unmitigated expression of some of our most profound thoughts. 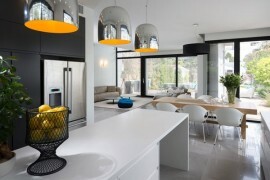 Designing a perfect home is as much a work of brilliant art as a masterpiece on canvas or a moving composition on guitar. It might be confined to the walls of your home. 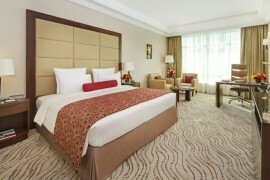 Yet, beautiful interiors designed with care give you as much pleasure as any other piece of creative brilliance. 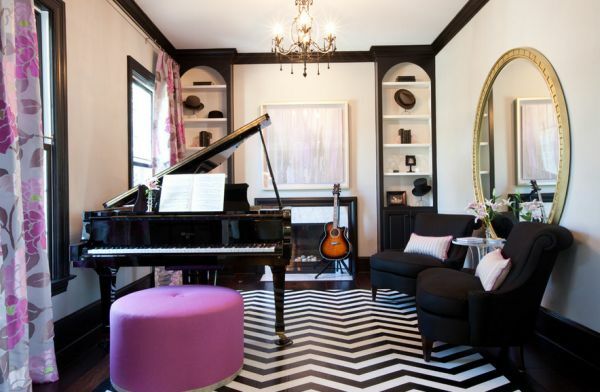 Why not then bring together this passion for design and the magic of music to create charming and unique interiors? 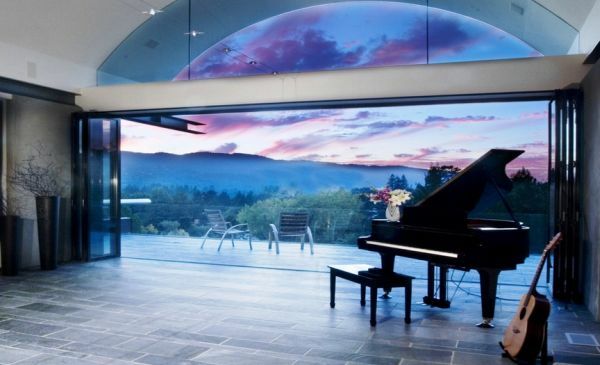 Stunning living room offers an inspirational view for some sweeping tunes! 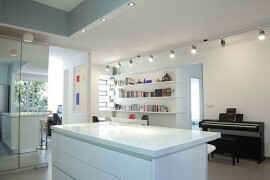 A stunning piano or your favorite guitar need not always be relegated to the inner confines of your home. 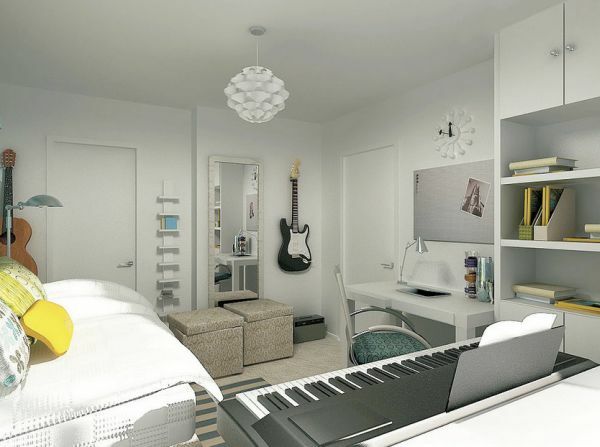 Many among us might not have the space or the necessity for a dedicated music room. 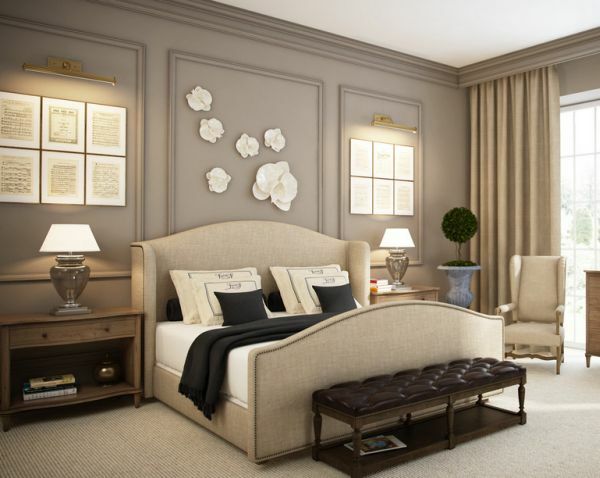 Yet, by adding our most cherished music instrument to the living room, bedroom or dining space setting, one can instantly uplift the ambiance of the room. Easy to work with, they bring in a very personal and distinct aura along with a lifetime of memories. 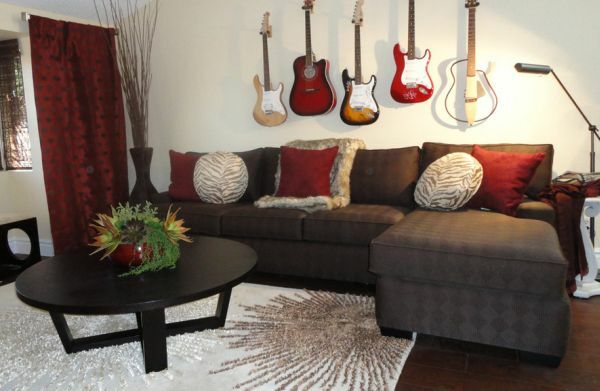 Let your guitar collection steal the show! 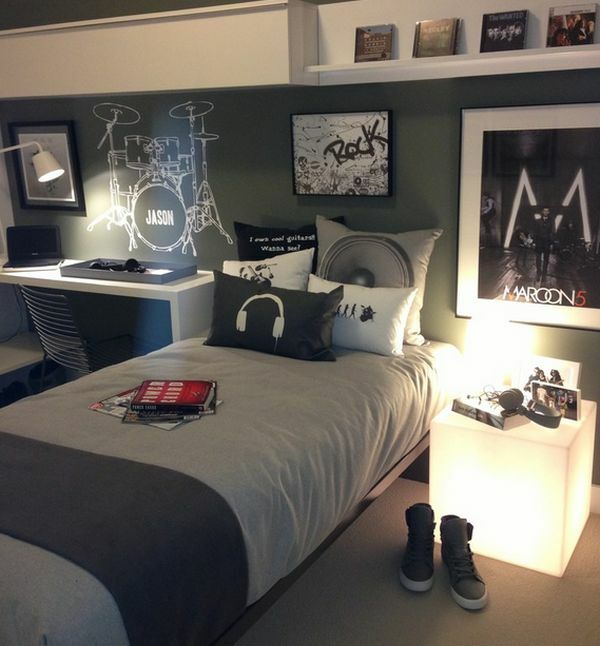 Modern bedroom that is all about hitting the right note! 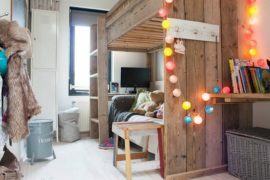 This kids’ room clearly trumpets style and sophistication! If you are blessed enough to be proficient in playing a certain musical instrument, then it most brings along with it much more than mere notes and tunes. The early days of squeaking and thumping noises that others around you had to put up with and the subsequent delight at mastering the instrument all come flashing before ones’ eyes. Music instruments carry along with them cherished memories. 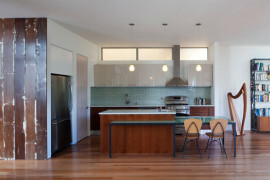 The best way to relive this nostalgic past is by making the instrument a part of your home’s décor. 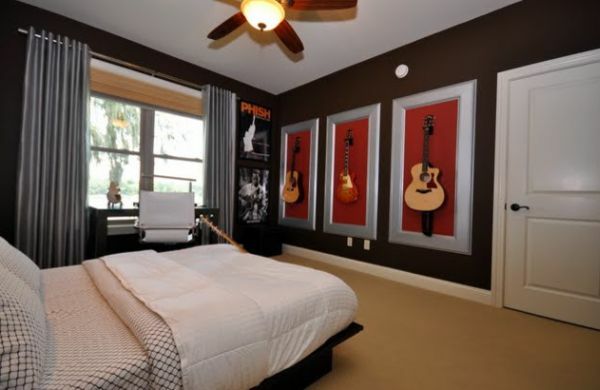 Rock-n-Roll themed bedroom for those who prefer melodious dreams! Since adult lives generally leave us with little time to spend with our drum set from college or the guitar from a decade ago, their visual presence might tempt us to pick them up one more time. 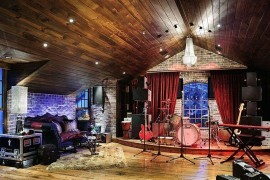 Even if you don’t like how that sounds, musical instruments offer amazing visual contrasts as decorations. From being the center of attraction to playing second fiddle, they are as versatile as the notes that they play! 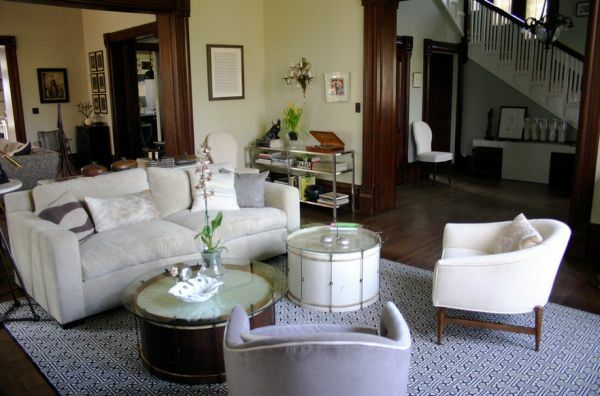 Vintage drum table – A memory of a more rollicking past! 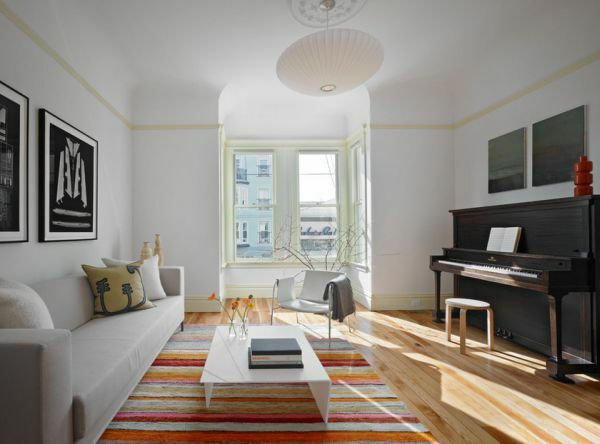 Placing a piano in the living room can be as much fun as playing it. 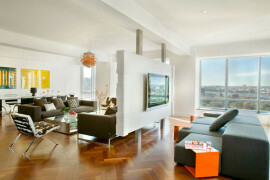 It also takes equal amount of skill and exquisite balance to ensure that the space does not look cluttered or ungainly. 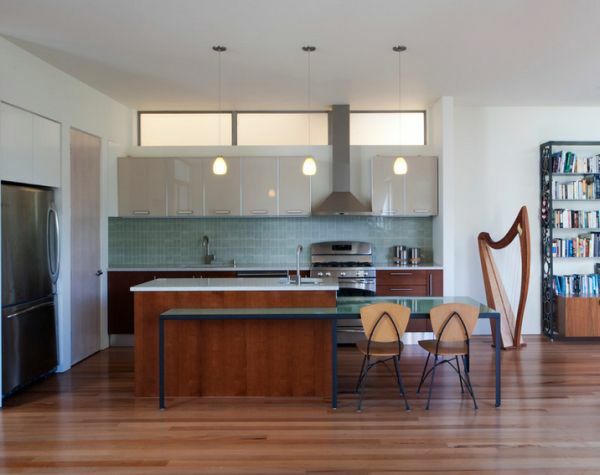 With most contemporary living spaces being clad in stone, glass and concrete, the wooden surface of the piano offers warm and welcome variation. 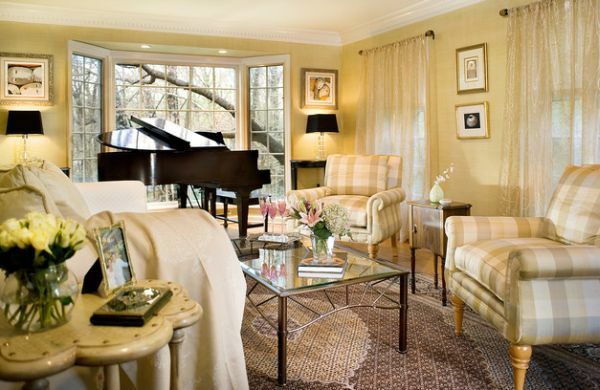 It is all the more appealing when a grand piano in deep, dark shades of wood is placed in a pristine white setting. 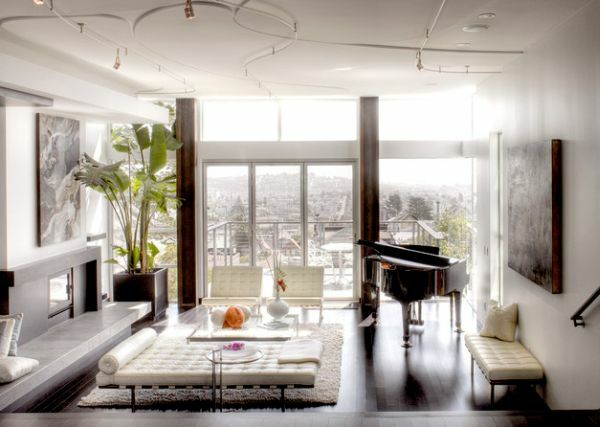 Try to place the piano in a setting that is as orderly as possible as too many furnishings can cramp the room visually. Music has an innate ability to uplift the soul. 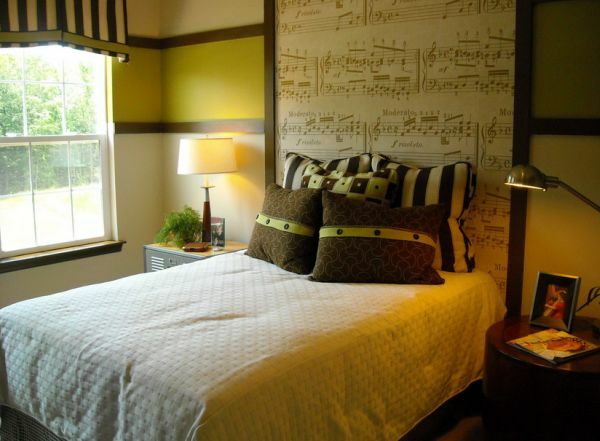 That is precisely why surrounding oneself with musical iconography helps create a soothing and refreshing atmosphere. At times, mere sight of an instrument can infuse positive energy even if we do not take time out to indulge in the many delights it has to offer. 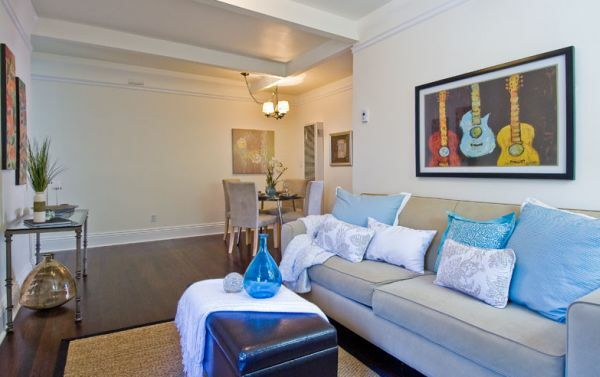 Guitar is arguably the single most widely used music instrument in decorating interiors. 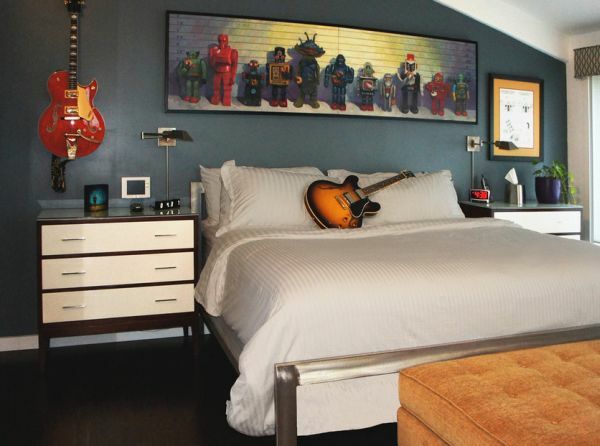 From posters and wall art to signed memorabilia and special collector pieces, guitars seem to find their way into more homes than any other instrument. 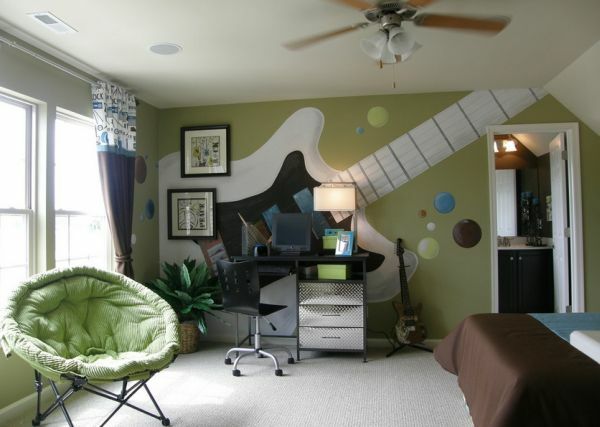 Decorating with a guitar is not all too hard and most walls seem to welcome them cheerfully! 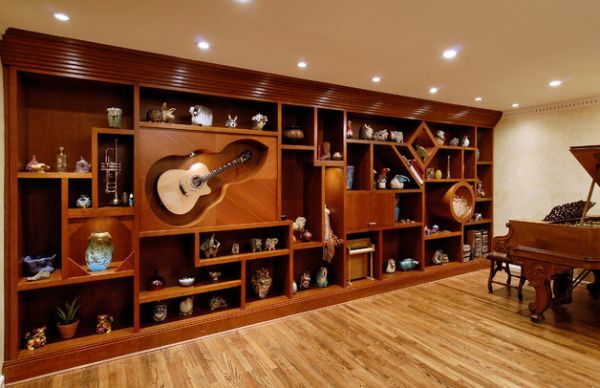 You can also use a custom-designed stand or a wall shelf to showcase your collection of string instruments. 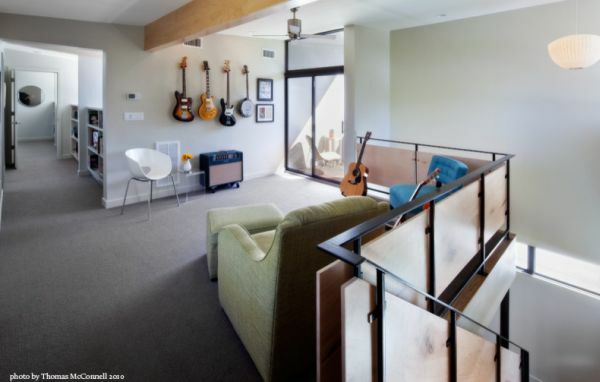 The lasting influence of Rock-n-Roll’s golden era and the adulation garnered by lead guitarists has pretty much cemented guitar’s place in the hearts and homes of millions across the globe. 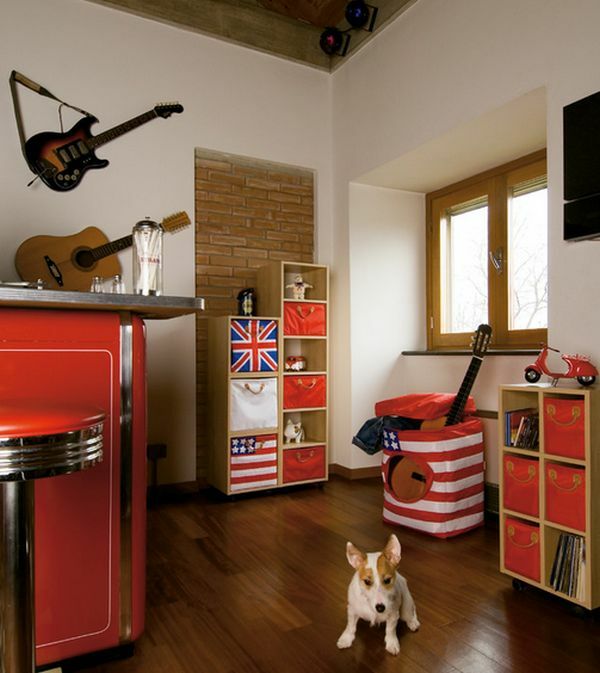 Custom wall unit that allows you to display your own musical inclinations! Cleverly placed trumpets, old drums ingeniously transformed into coffee tables and wall art that pays a tribute to your favorite musician; all offer a chance to tout your love for music in a creative manner. 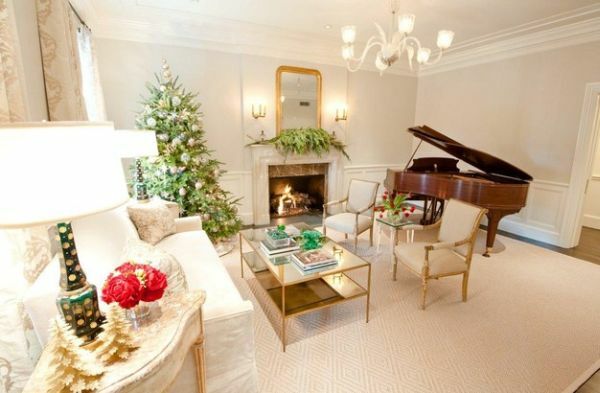 How you go about decorating with musical overtones depends on your own personal taste. Much like the world of music, the possibilities here are also simply endless! 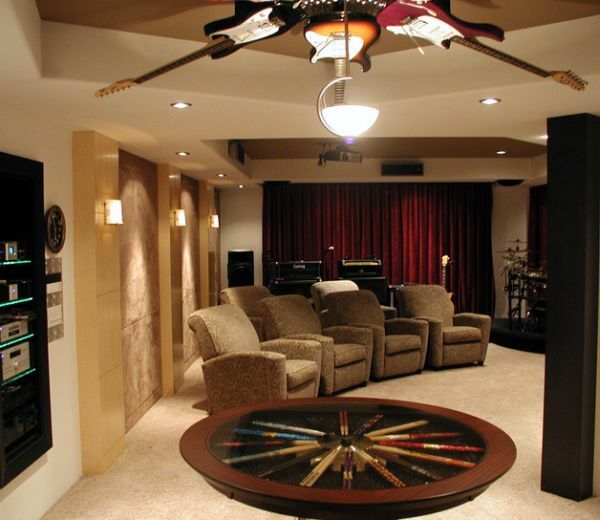 Innovative guitar fan in the media room pays tribute to the golden era of Rock-n-Roll! 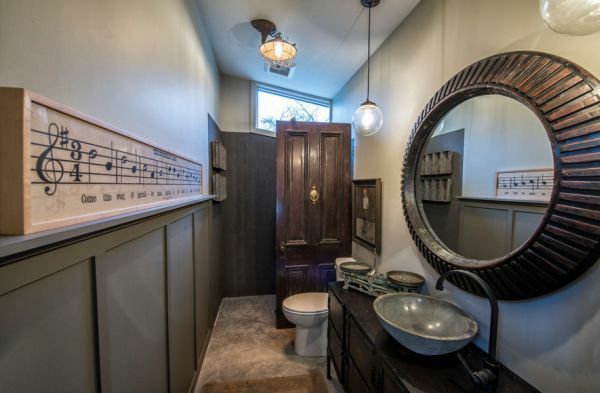 Gorgeous framed music roll in the bathroom – Truly distinct!